Although he produced a number of tapestries and paintings while at Rorke’s Drift, Muafangejo is known almost entirely as a printmaker; his linocuts are also particularly well known. In this respect, Azaria Mbatha (qv. ), who favoured the medium, influenced Muafangejo as did many other artists who studied at Rorke’s Drift. In addition, the relative inexpensiveness of the medium and the fact that it does not require sophisticated printing equipment made it an attractive and feasible option for many black printmakers. But, like many others, when Muafangejo had access to the necessary equipment and materials, he produced an impressive body of woodcuts and intaglio prints. In intaglio, he seldom used etching on its own, preferring to combine it with aquatint (for tonal areas) and he was particularly adept in the use of drypoint – where the image is scratched directly into the plate. The immediacy and vividness of drypoint proved a sympathetic medium for his images. In his prints Muafangejo used a clear and unambiguous language – he could literally and figuratively tell a story in black-and-white, and there is always a strong narrative component in his work. Characteristically, a dramatic incident often forms the subject of his prints with the ‘characters’ in the story dispersed over the sheet, occupying a shallow space. This narrative is often extended, with text incorporated into the print. Text at times becomes so important that the print resembles a page from a medieval illuminated manuscript. Some commentators have seen Muafangejo as ‘naïve’ and ‘primitive’ – but this is far from true. He, in fact, produced work which comments with subtlety and insight on the world around him. Although direct references to contemporary political events are rare, his work does refer – if obliquely – to the repressive regime at the time, and he often used Zulu and Ovambo history to provide an indirect comment in this regard. Religious subjects feature prominently in his work, reflecting his strong religious background. But, even here, Muafangejo also commented on the political and social role of the Church in resisting and opposing an inhumane and unjust regime. Many of his prints are of an autobiographical nature and refer to dramatic or humorous incidents in his life. But the references to his personal life are mediated by a gentle humour and an objectivity which transcends the merely anecdotal. The lucky artist, a linocut of 1974, (plate 180) was conceived after the announcement on Radio Owambo that Muafangejo had won a silver cup for an exhibition. Muafangejo did not know for which exhibition he had won the award, but decided to celebrate by making this print. This was just as well, for in the end, he did not receive a cup at all! Although very disappointed, Muafangejo, typically, does not show this in his print. In a relatively short working career he produced an impressive body of work which has influenced generations of printmakers in Southern Africa. 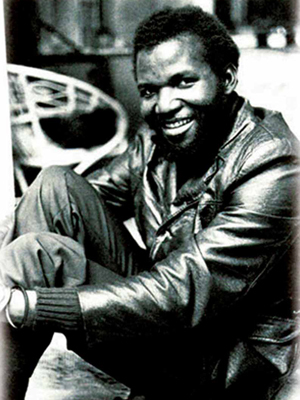 Born Etunda lo Nghadi, Angola, 1943; died Katutura, Windhoek, Namibia, 1987. Training 1967–1969: Evangelical Lutheran Art and Craft Centre at Rorke`s Drift, KwaZulu Natal. Selected Exhibitions 1968 onwards: Group Exhibitions in South Africa, Namibia, Germany, United Kingdom, Canada, Brazil and Scandinavia. 1971: First solo exhibition, Kunstkabinette, Windhoek. 1971: Sao Paulo Biennale. 1976: Black South Africa: Graphic Art, Brooklyn Museum, New York. 1981: Republic Festival Exhibition, Durban. 1987: Johannesburg Art Gallery. 1987: Standard Bank National Arts Festival, Grahamstown, posthumously as guest artist. 2001: The Short Century: Independence and Liberation Movements in Africa, 1945–1994, Museum Villa Stuck, Munich, touring. Collections Iziko South African National Gallery, Cape Town; Johannesburg Art Gallery. Durban Art Gallery; De Beers Centenary Art Gallery, University of Fort Hare, Alice; Pretoria Art Museum. The subject of herding goats might at first suggest a Biblical interpretation, but given the autobiographical nature of so much of Muafangejo’s work, it is fairly safe to assume that he is representing himself as a young boy in this etching (plate 30). This was once one of his childhood responsibilities when growing up in Namibia. Look after Goats may be usefully compared to his Herdman, an etching that he produced in the same year. 1 In both etchings the herdman is positioned to the right. In Look after Goats the herdman holds what appears to be a knobkerrie in his left hand and an Ovambo knife in his right. In Herdman he holds a spear and a knobkerrie in each hand, with an Ovambo knife standing in the foreground. The Ovambo knife, although perhaps confusingly represented over-scale, conforms in every way to the form of such knives as they are seen in Namibia. They consist of a carved wooden handle that slots into a wooden scabbard that has a ‘foot’as well as a triangular orifice through which one can see the blade. These weapons were obviously necessary as self- protection against wild beasts. There seem to be only three known prints of Look after Goats, one of which is in the Killie Campbell Collections of the University of KwaZulu-Natal. Muafangejo uses drypoint, etching and aquatint in this etching to varied effect. The large speckles on the darker goats were made by a variation of the aquatint technique in which specks of resin were dusted onto the heated etching plate using a bag made from a nylon stocking. Various aspects in the drypoint drawing of the goatherd figure suggest that he applied his etching needle at an angle to obtain a line with a burred edge. See Orde Levinson (ed.). 1992. I was lonelyness. Struik Winchester. Cape Town. Illustration xxxi, p.285 and ref. p.377.